, an English engraver of the first eminence, was born in the Island of Pomona in Orkney, July 14, 1721. He was lineally descended from sir David Strange, or Strang, a younger son of the family of Stranges, or Strangs, of Balcasky in the county of Fife, who settled in Orkney at the time of the Reformation. He received his classical education at Kirkwall in Orkney, under the care of a learned, worthy, and much-respected gentleman, Mr. Murdoch M’Kenzie, who rendered great service to his country by the accurate surveys and charts he gave of the island of Orkney, and of the British and Irish coasts. Mr. Strange was originally intended for the law; but that profession ill according with his peculiar turn of mind, he quitted it in a short time, and while yet uncertain whither his genius really pointed, went aboard a man of war bound for the Mediterranean. From this voyage he returned so much disgusted with a sea-life, that he again betook himself to pursuits of law, and might have continued to prosecute them through life, and his talents as an artist been for ever lost to the world, if his brother had not accidentally discovered in his bureau a variety of drawings and unfinished sketches, with which he appears to have amused those hours that his friends supposed devoted to severer labours. 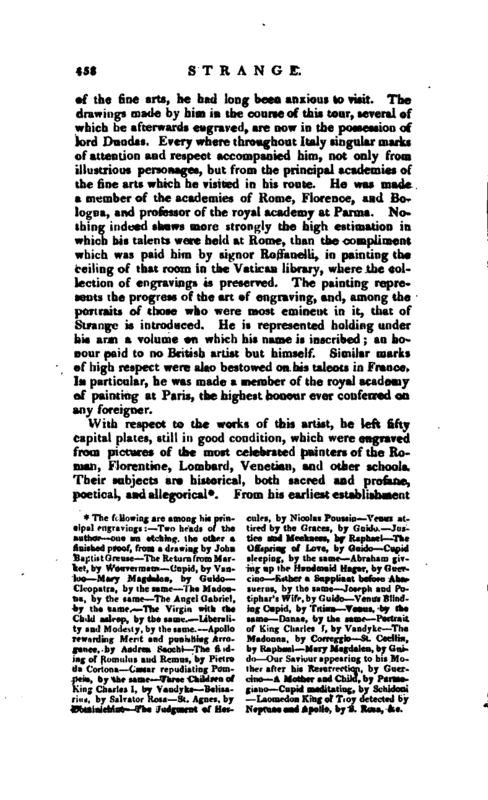 These first essays of genius struggling to display its peculiar powers, were shewn to the late Mr. llichard Cooper, at Edinburgh, the only person there who, at that time, had taste in such performances; they were by him very highly approved, and he immediately | proposed that the young man should be regularly placed under his tuition. This measure, coinciding perfectly with his own inclinations, was accordingly adopted. The rapid progress which he made under this master’s instructions soon satisfied his friends that in making the arts his study and profession, he had yielded at last to the bent of nature, and was following the course which genius prompted him to pursue. While he was thus assiduously engaged in laying the foundation of his future fame, a fatal interruption to the arts of peace took place in Scotland, by the arrival of the young chevalier; and Strange, urged by many motives, and particularly by the desire of gaining a hand which was already become necessary to his happiness, joined the rebel army. He continued to act with it as one of the troops styled the Life-Guards, a post of danger as well as honour, till the total defeat of the Pretender’s few remaining troops on the field of Culloden, obliged him and all those who escaped the issue of the day, to fly for shelter to the Highland hills. There young Strange, among the rest, continued concealed for many months, enduring hardships, the detail of which would seem to make dear the purchase even of life itself. Before the period of this overthrow, and soon after the battle of Falkirk, he so narrowly escaped the severest fate of war, that the accident deserves to be recorded. Having received command to execute some military order, in the absence of an aid-de-camp, he was riding for that purpose along the shore, when the svrord which he carried was bent in his hand by a ball from one of the king’s vessels stationed off the coast. 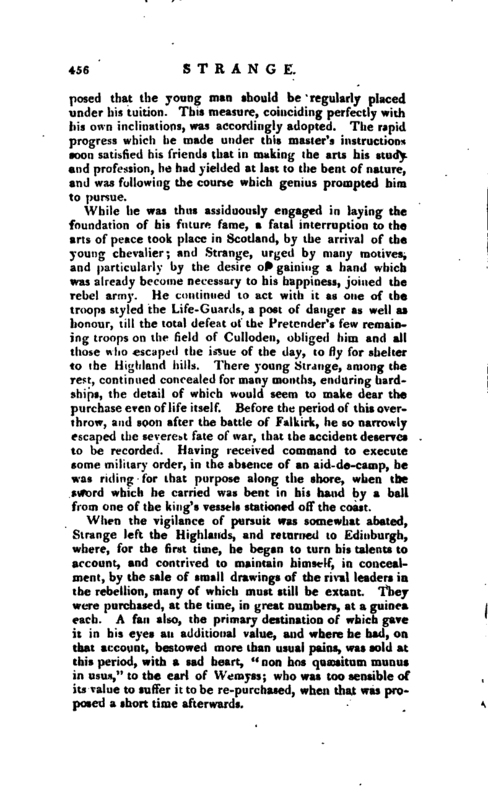 When the vigilance of pursuit was somewhat abated, Strange left the Highlands, and returned to Edinburgh, where, for the first time, he began to turn his talents to account, and contrived to maintain himself, in concealment, by the sale of small drawings of the rival leaders in the rebellion, many of which must still be extant. They were purchased, at the time, in great numbers, at a guinea each. A fan also, the primary destination of which gave it in his eyes an additional value, and where he had, on that account, bestowed more than usual pains, was sold at this period, with a sad heart, “non hos quacsitum munus in usus,” to the earl of Wemyss; who was too sensible of its value to suffer it to be re-purchased, when that was proposed a short time afterwards. | Tired of a life of alarm and privacy,lr. Strange, at length, after much difficulty, procured a safe conduct to London, intending to embark for France; but not till he had received the reward peculiarly due to the brave; and made that hand his own, for the sake of which he had risked his life in the field. The name of the lady to whom he was thus united in 1747, and in whose steady affection, through the whole of a long life, all those dangers were forgotten, was Isabella Lumisden, the daughter of an ancient and respectable family, and sister to a gentleman well known in the literary world for his instructive work on the antiquities of Rome. Having safely reached London, Mr. 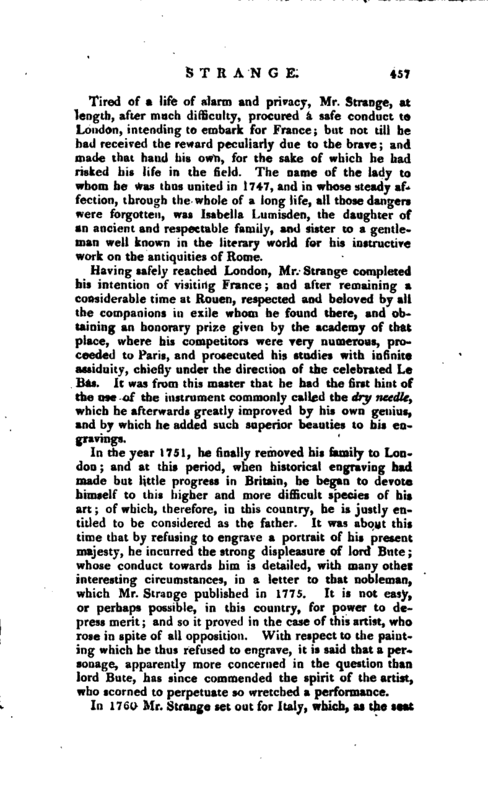 Strange completed his intention of visiting France; and after remaining a considerable time at Rouen, respected and beloved by all the companions in exile whom he found there, and obtaining an honorary prize given by the academy of that place, where his competitors were very numerous, proceeded to Paris, and prosecuted his studies with infinite assiduity, chiefly under the direction of the celebrated Le Bas. It was from this master that he had the first hint of the use of the instrument commonly called the dry needle, which he afterwards greatly improved by his own genius, and by which he added such superior beauties to his engravings. In the year 1751, he finally removed his family to London; and at this period, when historical engraving had made but little progress in Britain, he began to devote himself to this higher and more difficult species of his art; of which, therefore, in this country, he is justly entitled to be considered as the father. It was about this time that by refusing to engrave a portrait of his present majesty, he incurred the strong displeasure of lord Bute; whose conduct towards him is detailed, with many other interesting circumstances, in a letter to that nobleman, which Mr. 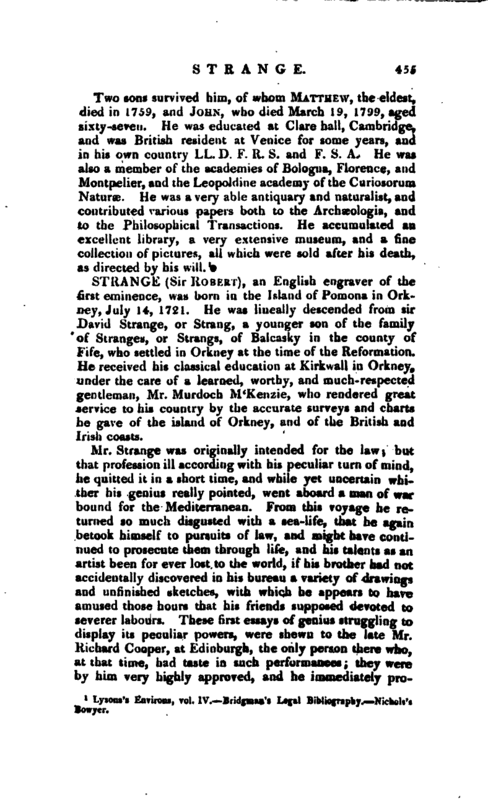 Strange published in 1775. It is not easy, or perhaps possible, in this country, for power to depress merit; and so it proved in the case of this artist, who rose in spite of all opposition. With respect to the painting which he thus refused to engrave, it is said that a personage, apparently more concerned in the question than lord Bute, has since commended the spirit of the artist, who scorned to perpetuate so wretched a performance. In 1760 Mr. Strange set out for Italy, which, as the seat | of the fine arts, he had long been anxious to visit. The drawings made by him in the course of this tour, several of which he afterwards engraved, are now in the possession of lord Dundas. Every where throughout Italy singular marks of attention and respect accompanied him, not only from illustrious personages, but from the principal academies of the fine arts which he visited in his route. He was made a member of the academies of Rome, Florence, and Bologna, and professor of the royal academy at Parma. Nothing indeed shews more strongly the high estimation in which his talents were held at Rome, than the compliment which was paid him by signer Roifanelli, in painting the ceiling of that room in the Vatican library, where the collection of engravings is preserved. The painting represents the progress of the art of engraving, and, among the portraits of those who were most eminent in it, that of Strange is introduced. He is represented holding under his arm a volume on which his name is inscribed; an honour paid to no British artist but himself. Similar marks of high respect were also bestowed on his talents in France. In particular, he was made a member of the royal academy of painting at Paris, the highest honour ever conferred on any foreigner. The following are among; his principal engravings: Two heads of the —thor one an etching, the othnr a finished proof, from a drawing by John Baaptist Greuse—The Retun from Mark ket, by Wouvermans—Cupid, by Vanloo—Mary Magdalen, by Guido— Cleopatra, by the same—The Madonna, by the same The Angel Gabriel, by the same. The Virgin with the Ch ld asleep, by the saruo. l.i’uer.ility an 1 Modesty, by the same. Apollo rewarding Mer.t and punishing Arro­. by Andrea Sai-chi Tl>e finding of Ronnilos and Remus, by Pieiro da Cortoua C\sur repudiating PomjK-ia, by the same Three Children of King Charles I, by Vandyke Belisarius, by Salvador Eosa St. Agnes, by Dominichino The Judgment of Her­ culcs, by Nicolas Poussin Venus attired by the Giacrs, by Gui>!i>. Jnstice and Meekness, by Raphael The Offspring of Love, by Guido Cupid sleeping, by the samp Abraham ing up the Handmaid Kagar, by finer­ cino---Esther a Suppliant before Ahasuerus, by the same Joseph and Potiphar’s Wife.by Qaido Venus Blinding Cupid, by Titian Venus, by the saint Dnnae, by the same Portrait of King Charles I, by Vandyke The Madonna, by Correggio St. Cecilia, by Raphael Mary M tinido Our Saviour appi-. - Mother after his 1 cino A Mother and Child, by Pannrgiano Cupid tneditat’m<;, by Soiiidoni Laomedon Krng of Troy detected by Neptune and Apoilo, by S. llosa, &c.
| in life, Mr. Strange selected carefully about eighty copies of the finest and must choice impressions of each plate which he engraved, intending to present them to the public when age should disable him from adding to their number. These he collected into as many volumes, arranged in the order of their publication. To each volume he prefixed two portraits of himself, on the same plate, the one an etching, the other a finished proof, from a drawing by John Bapiiste Greuse. This is the last plate he engraved, and is a proof that neither his eyes nor hand were impaired by years. It shews likewise the use he made both, of aqua fortis and of the graver. Each volume, besides a dedication to the king, contains an introduction, on the progress of engraving; and critical remarks on the pictures from which his plates were taken. Among these engravings, it will be observed, there is only one from the painting of any native artist of this country; and that is from Mr. West’s apotheosis of the king’s children. 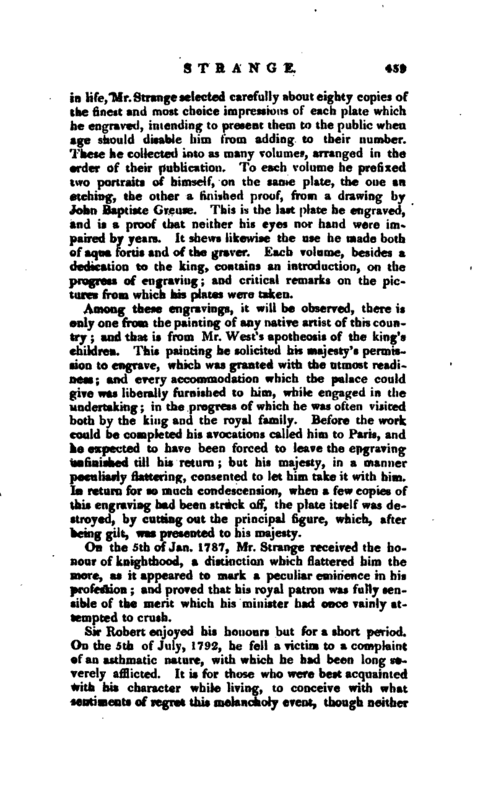 This painting he solicited his majesty’s permission to engrave, which was granted with the utmost readiness; and every accommodation which the palace could give was liberally furnished to him, while engaged in the undertaking; in the progress of which he was often visited both by the king and the royal family. Before the work could be completed his avocations called him to Paris, and he expected to have been forced to leave the engraving unfinished till his return; but his majesty, in a manner peculiarly flattering, consented to let him take it with him. In return for so much condescension, when a few copies of this engraving had been struck off, the plate itself was destroyed, by cutting out the principal figure, which, after being gilt, was presented to his majesty. On the 5th of Jan. 1787, Mr. Strange received the honour of knighthood, a distinction which flattered him the more, as it appeared to mark a peculiar eminence in his profession; and proved that his royal patron was fully sensible of the merit which his minister had once vainly attempted to crush. Sir Robert enjoyed his honours but for a short period. On the 5th of July, 1792, he fell a victim to a complaint of an asthmatic nature, with which he had been long severely afflicted. It is for those who were best acquainted with his character while living, to conceive with what sentiments of regret this melancholy event, though neither | untimely nor unexpected, was felt by his family and friends. Of aM Uk-;-! whom the writer of this narrative ever knew, sir Hubert ossessed the mildest and most ingenuous manne! s, i.uned to dispositions of mind the most liberal and benign. There was in his temper an endearing gentleness which invited affection; and in his heart a warm sincerity, immediately perceptible, which infallibly secured it. To know him and be his enemy was impossible. Unassuming even to a fault, and with a diffidence which anxiously shunned pretension, his opinions both of thinking and of expressing himself, even on the most unimportant occasions, laid an irresistible, though unconscious claim, to taste, to sentiment, and to genius. These, indeed, a skilful physiognomist, if such a person exists, might have read distinctly in the features of his countenance; though Lavater, to support a theory, or misled by an imperfect likeness, has asserted the contrary. The head engraved from Greuse, and prefixed to sir Robert’s posthumous volume, bears a strong, though scarcely a striking resemblance, to the original, and will probably be thought to justify what is here advanced. It may certainly with equal truth be added, that in the whole of his deportment and general demeanour, there was a remarkable degree of grace and modest dignity. 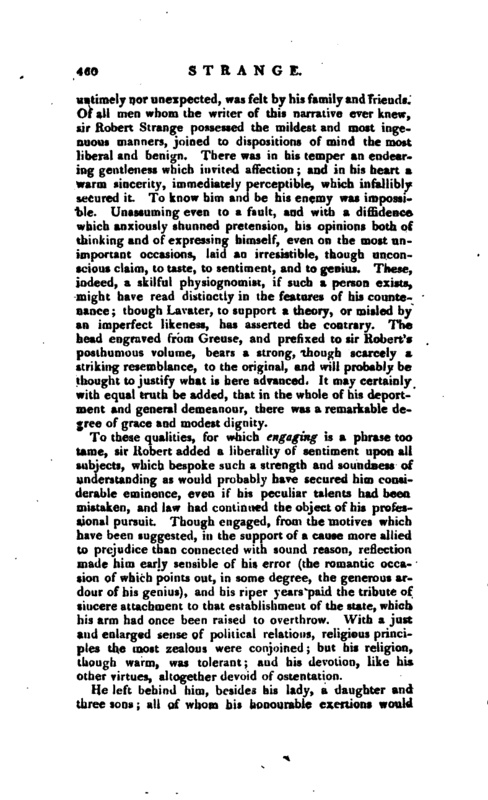 To these qualities, for which engaging is a phrase too tame, sir Robert added a liberality of sentiment upon all subjects, which bespoke such a strength and soundness of understanding as would probably have secured him considerable eminence, even if his peculiar talents had been mistaken, and law had continued the object of his professional pursuit. Though engaged, from the motives which have been suggested, in the support of a cause more allied to prejudice than connected with sound reason, reflection made him early sensible of his error (the romantic occasion of which points out, in some degree, the generous ardour of his genius), and his riper years paid the tribute of sincere attachment to that establishment of the state, which his arm had once been raised to overthrow. With a just and enlarged sense of political relations, religious principles the most zealous were conjoined; but his religion, though warm, was tolerant; and his devotion, like his other virtues, altogether devoid of ostentation. 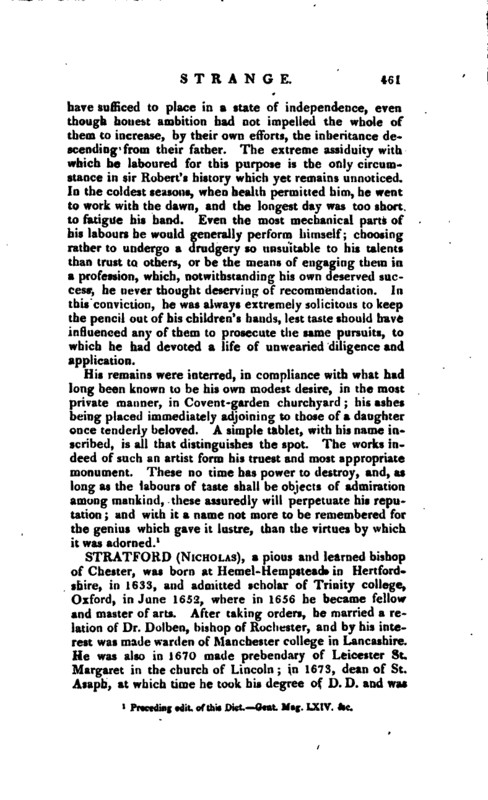 He left behind him, besides his lady, a daughter and three sons all of whom his honourable exertions would | have sufficed to place in a state of independence, even though honest ambition had not impelled the whole of them to increase, by their own efforts, the inheritance descending from their father. The extreme assiduity with which he laboured for this purpose is the only circumstance in sir Robert’s history which yet remains unnoticed. In the coldest seasons, when health permitted him, he went to work with the dawn, and the longest day was too short to fatigue his hand. Even the most mechanical parts of his labours he would generally perform himself; choosing rather to undergo a drudgery so unsuitable to his talents than trust to others, or be the means of engaging them in a profession, which, notwithstanding his own deserved success, he never thought deserving of recommendation. In this conviction, he was always extremely solicitous to keep the pencil out of his children’s hands, lest taste should have influenced any of them to prosecute the same pursuits, to which he had devoted a life of unwearied diligence and application. Preceding edit. of this Dict.—Gent. Mag. LXIV. &c.